Marc Anthony said “If you do what you love, you’ll never work a day in your life.” Never have truer words been spoken. The downside to this type of idealism is that it also gives you a false sense of reality when it comes to the amount of hard work actually involved in running a company. This is especially relevant for small businesses that do not have the resources to allow for larger budgets and the trial-and-error approach that many larger companies have. We learn how to manage lean operations to survive the early days and, if we want to stay in business, we quickly adapt a fiscally conservative business model. We sock away our profits for those rainy days that inevitably come during the down cycles in our industries. What is Commercially Useful Function (CUF) on a state funded project? Performing a Commercially Useful Function (CUF) is a critical requirement of doing business with the state. This information is relevant to you, whether you are a prime contractor or a subcontractor doing business with the state. It is the law! Each certified Small Business (SB) or Disabled Veteran Business Enterprise (DVBE) must perform a CUF when bidding/participating on any state contract as a contractor, subcontractor, or supplier of goods and/or services, regardless of the procurement or payment method. If you are a prime contractor subcontracting with a state-certified SB or DVBE, it is recommended that you verify the subcontractor(s) can perform a CUF on a specific contract before listing them on the bid documents. What is the CM/GC Delivery Method? A unique method used to accelerate project delivery is the Construction Manager/General Contractor (CM/GC) process. In the CM/GC process the project owner hires a contractor to provide feedback during the design phase before the start of construction. With Granite Construction at their side, the CPM Logistics Team hit the road for an amazing set of informative outreach events for the Klamath River Renewal Project (KRRP). 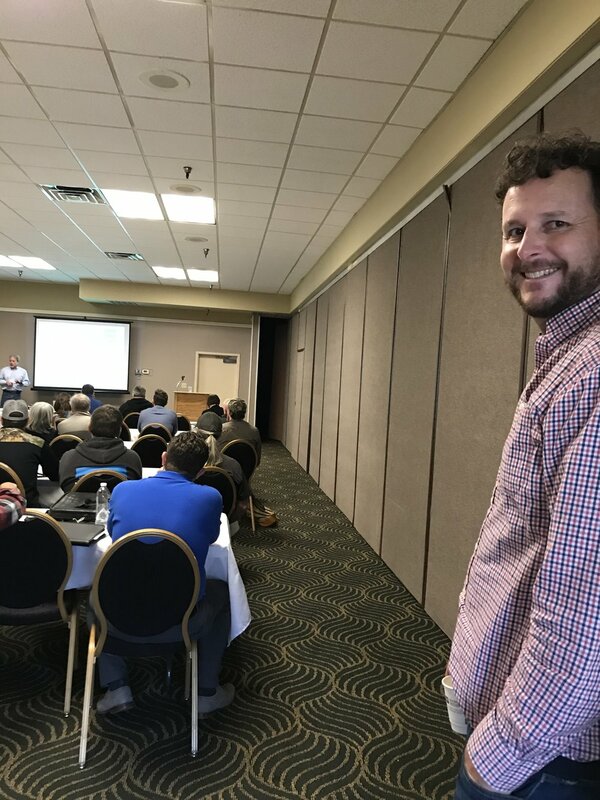 On Tuesday, January 29, 2019, CPM Logistics and Granite Construction hosted two outreach meetings in in Klamath Falls, CA and Yreka, OR. 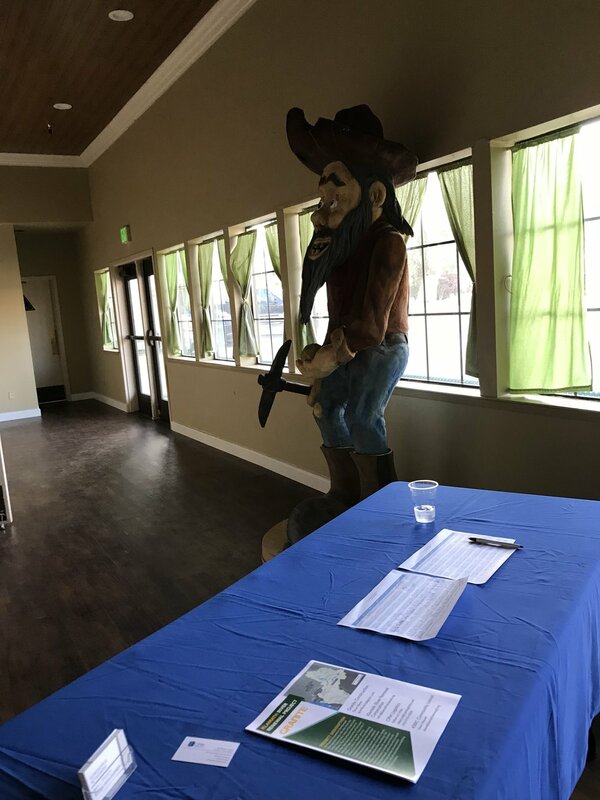 The purpose of the meetings was to inform local and tribal contracting entities of the Klamath River Renewal Project and Granite’s commitment to engaging local and small businesses on the Project. Attendance at both meetings exceeded expectations; this being many attendees first KRRP outreach meeting. Although most attendees had general knowledge of KRRP, they appreciated the additional project details as well as the discussion on job opportunities that Granite and CPM provided. The wide-range of capabilities collectively among companies attending reflect the vast scope of the project: there were trucking companies, concrete crushers and dirt movers, fish biologists, water labs, and native plant species experts. Also in attendance were union representatives and members of the local Tribal Employment Resource Ordinance (TERO) offices. "It makes good economic and time sense to fully engage the unique expertise the local contracting community already has,” said Dave Niess, Project Executive. He went on to detail the various facets of the project and many of the challenges involved with the scope of work. He concluded by emphasizing Granite Construction's commitment to utilizing local knowledge, know-how and labor stating. "If I see available local, skilled laborers sitting out this project, then that's a failure on my part." CPM Logistics is serving as the project team's Small Business Program consultant. Our mission is to help remove barriers between primes and local and tribal contractors. A sample of recent jobs that Silveira Consulting worked on, include: City of Fresno, City of Dixon, Napa County and California Department of Parks and Recreation. Jamie has spent years building relationships both on and off the jobsite gaining trust and respect from not only her clients but from the workers as well. She and her team provides training and support to the client and can also perform all comprehensive compliance paperwork requirements. Jamie considers herself to be the problem solver and not just an enforcer of the requirements, thus mitigating any risk. Her dynamic team brings all resources to their projects to assure success for everyone. In 2019, C&S Publishing will celebrate its 30th year in business serving California’s small business contractors. Catherine Wood has been the owner and operator of C&S Publishing for the last two years. Under her leadership, the company connects small businesses and contractors through their three weekly editions of The Daily Reporter, or TDR. Building on what they already offer to construction contractors, Catherine is very excited to launch a brand new service in January, TDR Plus. It is a subscription software service that enables busy estimators and owners of construction companies who spend too much time looking for new jobs to feel relief when the perfect new jobs arrive to them just like magic. With TDR Plus, construction estimators will always know when there's a new job to bid on in their area and industry without having to spend hours searching websites or spend a lot of money on other sites or organizations for bidding information. A free, preview version of TDR Plusis available right now for people who would like to check it out and provide their feedback on the service before the full, paid version launches in January. You can sign up at thedailyreporter.net/register. Catherine is a member of the National Association of Women Business Owners, and C&S Publishing is a certified Minority Business Enterprise (MBE), Women Business Enterprise (WBE), Disadvantaged Business Enterprise (DBE), and a Small Business Enterprise (SBE). C&S Publishing is based out of Antelope, Calif., and can be reached at CandSPublishing@gmail.com. Over the years, we have had the privilege to work with our small contractor friends by providing support and resources for a myriad of obstacles that have ranged from cash flow issues to dispute resolution with agencies and primes. Often, many of these issues are resolved by education and communication between the parties. Occasionally, those issues are more contentious and are addressed through third party support such as arbitration and mediation. Most recently, a friend approached us about subcontractor listing issues and wanted to know their rights as a listed subcontractor on a bid/build project. In that particular instance, the prime that was found responsive and awarded the project had listed this subcontractor and, after the award, decided not to use the services on the project. Our friend wanted to know their rights for recompense and how to avoid this situation in the future. When a subcontractor is listed on bid for a publicly funded project, and the prime is awarded the contract, the prime must submit a substation request based on the following criteria. ﻿Knowing your rights as a small contractor are imperative to protecting your company and minimizing your company’s risks. This holds true for all listed subs, regardless if you are small business certified or not. If you have any questions or want additional information, please feel free to send me an email at abbigail@cpmlogistics.net. Bonding is often cited as the primary barrier to small business participation in public works construction. One of the primary reasons bonding is so difficult to obtain is that the surety companies are writing bonds with the expectation of no defaults, which means the companies seeking bonding must be able to demonstrate capacity, strong financials and good character. Merriwether & Williams Insurance Services has administered contractor development and bonding programs throughout the state for over 21 years and we encourage small businesses to utilize our free services to grow their businesses. Merriwether-administered programs conduct vigorous outreach in line with sponsor opportunities and priorities and engage targeted businesses in assessment, education, technical assistance and matchmaking with prime partners. Current sponsors include the City and County of San Francisco (including the Airport, Port, Muni, S.F. Public Utilities Commission and public works), City of Los Angeles (including the Airport, Port, Water and Power and public works), L.A. County Metro (with $125 Billion in development and construction projected over the next twenty years) and Alameda County, which has a $580 Million Affordable Housing Bond with a 20% small business inclusion requirement. Each of these sponsors has established a $4 - $8 Million collateral pool, which guarantees any losses from defaults on the bonds issues. In over 21 years, with over $900 Million in bonding made available to small, women, minority and veteran-owned businesses, all programs combined have experienced less than 1% default rate in an industry with a steady default rate over 20%. Merriwether is proud to be able to assist small and emerging firms who create jobs and economic prosperity in their communities and thank our sponsors who understand the social and economic benefit of inclusion and equity. What type of business is this and what services do you offer? We offer CIDH, Shoring, CiSS Pile, Soil Nail Walls, Driven Pile -- these are our main services. We also will help with project management and consulting on difficult projects. Our team combined has over 80 years experience. We have been in business since 2014, with that said did not receive our DBE till 2017. What are some recent jobs you've done? My most recent job has been learning how to navigate the Caltrans system in effort to work with them. We did get our first substantial break with Flatiron West on the I-5 Elk Grove project, which we are very excited about. We will be working on 4 soil nail walls. Currently, I am working on ways to tackle the market by working with my DBE competitors and larger competitors to create a positive outcome for all. When we started CPM, long before hiring our first employee, we realized that Small Contractors struggle because they do not have enough resources. Whether it be office staff, field workers, cash flow, equipment or a culmination of each, Small Contractors needed better resources support. Because of this, we recently began coordinating relevant, educational industry specific workshops to provide valuable information to our Small Business community. These topics include Labor Compliance & Prevailing Wage Requirements, the importance of filing a Preliminary Lien notice to protect your profits, Prompt Payment provisions and your right to get paid in a timely manner and The Everything Contractor (and why you should narrow down your scope of services). All of the Prime Sponsors for these events are donating their time because they want to provide the small contracting community access to their potential contracts as well as industry knowledge. These workshops can be found on our events page. Our office is pretty small so don’t wait to sign up! How lucky are we that we get to do something we love for work? Helping others is a core value that every CPM employee possesses and is something that drives us all to better serve our Small Contractor community. Like many other Small Businesses, we started CPM not because of money, but to develop and maintain a better quality of life for ourselves and our families. In July, we hosted several industry events to better inform Small Contractors about available contracting opportunities with both primes andagencies. One such event with Granite-Teichert, JV, was so well attended by potential subcontractors that there was standing room only. Not only do we listen to you, we put together action plans and events based on your feedback to improve small businesses odds of contracting on large programs. This past June and July, we sent out a Small Contracting survey asking for feedback on what obstacles your company encounters when searching for relevant, public works projects. 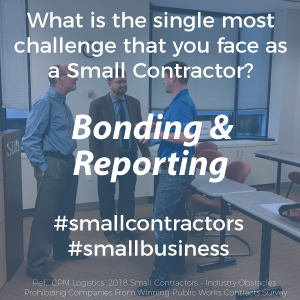 Not surprisingly, out of the 254 respondents, 24% reported that bonding was the single most challenging issue faced as a Small Contractor; 22.5% said prompt payment; and 11% responded that estimating assistance and competitive pricing were prohibitive for winning contracts. Our response to the survey feedback is to schedule time to connect you, the Small Business contractor, with those that want to provide both technical assistance as well as potential contract opportunities. In addition, we will be hosting an Estimating Workshop with Teichert on August 24; a Labor Compliance Workshop on September 27; and a Prompt Payment Workshop with Ferrovial on October 12. We are also currently working with the LAOC Building Trades on coordinating these workshops in Southern California, so make sure to check our events page for more information! Karen Wonnenberg started Rupert Construction Supply in 2002 – providing material supplies to contractors building bridge, highway and other civil engineering transportation projects. Rupert Construction Supply is a Disadvantaged Business Enterprise (DBE), a Woman-Owned Business Enterprise (WBE), and a Small Business Enterprise (SBE). Rupert Construction Supply has concentrated on bridges for much of the business, but Karen reports that she wanted to find a stronger niche, taking bridge concepts and finding more business in highway and rail, and water/wastewater treatment projects. Karen believes her success comes for the following mindset: As a DBE, be prepared to do the work. Don’t wait to be handed something by the contract. You need to be successful with or without the DBE certification, so operate as a business, not as a DBE business. The certification is just an added incentive to the contractor. June was a hectic month for our small staff at CPM. We hosted 9 Small Contractor events; nominated not 1, but 2, well deserving industry friends for service awards; attended countless meetings and conference calls in support of Small Business; continued our quest for data supporting Senate Bill 1 (SB-1 aka, the Gas Tax); all while running a business and addressing our everyday duties. We recently sent out a short, non-political 5-minute survey asking for information about your knowledge of SB-1 and the bill’s provisions. We have been monitoring the hundreds of responses. Not surprising, many Californians feel stretched thin by how much they pay in taxes to our federal, state and local governments; many are offended by not being offered the choice to vote on SB-1; most, if not all, would like to have open dialogue with those administering how the funds are managed. This survey will remain open until July 31 and the results will be made available to anyone that is interested in reviewing the data collected. All who have completed the survey to date have been respectful and civil – dialogue that we appreciate and encourage to help us all better understand how to move forward with supporting the repair of our highways, bridges and infrastructure. We will also begin hosting monthly educational workshops for Small Businesses that want to increase their capacity through industry best practices. Our response to this need is to engage agencies and primes to help us provide that knowledge to these companies on a regular basis. Keep an eye out on our events page. We hope that you are having a great summer!